The truism that "the only constant is change itself" applies not only to individuals but also to organizations. Change spares no one - including post offices. Before 1851, letters sent through the mail were charged by the number of sheets it contained and the distance it travelled. For example, a letter consisting of one sheet of paper was charged the single rate; a double letter, that is two sheets, was charged double the single rate, a treble letter, was charged three times the single rate, and so on. In other words, each additional sheet of paper increased the charge by one rate. The single letter rate in effect before January 1765, for instance, for a distance up to 60 miles was 4 pence. For a distance between 61 and 100 miles the single rate jumped to 7 pence and increased incrementally to 2 shillings and 5 pence for a distance between 901 and 1000 miles. It is interesting to note that these rates remained virtually unchanged and in some cases actually decreased slightly by 1851. While we tend to associate Rowland Hill with the introduction of the adhesive postage stamp in 1840, his greatest contribution to postal reform was really in demonstrating that the cost of transporting a letter did not depend on how far it was carried but by how many times it was handled en route. He also showed that counting the number of sheets of stationery in a letter was inefficient in arriving at the postage to be charged and made the argument that post office costs could be reduced substantially by standardizing weight increments. The postal reforms introduced by the British Post Office Act of 1710 automatically applied in Canada because, as a British colony, its Post Office was administered by London until 1851 when Westminster transferred the Post Office to the Province of Canada consisting of Upper and Lower Canada at the time. At about the same time, the use of envelopes was making inroads in Great Britain. Sealing a letter in an envelope effectively put an end to postal clerks' ability to count the number of sheets in a letter and an alternative method of determining the postage had to be found. Overweight mailings had previously required the items to be weighed but with the introduction of the Uniform Penny Postage act of 1839, the public could mail a letter not exceeding a half ounce in weight within the United Kingdom for one penny if prepaid, or two pence if paid on delivery. The Uniform Penny Postage Act became, effective January 10, 1840, also paved the way for the use of prepaid envelopes and the introduction of what we know today as the "Mulready" covers which, incidentally, are aggressively collected by philatelists and postal historians. But in the mid 1840s not everyone was enamoured with envelopes. Far from it. Letter sheets sealed with a red wax stamped with the writer's personal seal, perhaps engraved with an initial or similar identification, had a long tradition that some individuals were loath to relinquish. Some parsimonious Victorians could not see the need for enclosing their letters in another piece of paper. Charles Lamb, the famous English essayist, ranting about the use of envelopes, wrote: "Tis a modern foppery. I never enclosed one bit of paper in another, nor understood the rationale of it." But the tide could not be held back as the general public preferred the convenience of pre-gummed envelopes over the use of sealing wax. Once people began enclosing their letters in sealed envelopes, postal routines changed dramatically. At about the same time that the adhesive postage stamps and envelopes made their appearance, postal administrations began to experiment with strategically placed street letter boxes, known as pillar boxes because of their round, pillar-like shape, that permitted the public to mail letters from a place other than from a post office. For all these reasons, the use of postal scales became the nucleus of every post office. Scales had been in use since ancient Egyptian times so their use for everyday commerce was not unusual in the 1800s. What was new in 1840 was their ubiquitous use throughout the postal system. No post office could function effectively without one. Although the earliest scales used in post offices did not differ markedly from the ones in general use but as time went on they were adapted specifically for postal use. For example, a paper sleeve, also known as a weight sticker, was attached that showed the applicable rate of postage for any given weight. This innovation was quite a time saver as postal clerks no longer needed to weigh the item first then refer to a separate chart to determine the required postage for that particular weight. "Early scales were quite plain," says Eugene Labiuk, one of Canada's foremost postal scale collectors. "Salter was the big name in Great Britain and consequently in Canada because England supplied the Canadian Post Office Department with its early scales," he adds. 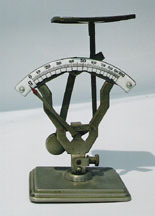 One of Labiuk's oldest Salter scales is what is referred to as a "hanging" scale because of the way it is suspended from an overhead support or held by hand. These so-called hanging or hand-held scales make use of a coiled extension spring that provides the balancing force. Compared to some of the complex models in existence today, a hanging scale is simple in its design. An extension spring is installed in a direct line between the support holding the top end of the spring and the load that is being weighed suspended at the bottom end of the spring. The weight of the letter is read directly off an attached pre-printed sleeve showing a series of incremental weights with their corresponding postage amounts attached to the housing around the spring. A metal clip or wire clasp attached to the spring holds the letter in place while it is being weighed. A second type of spring balance scale makes use of a compression spring as opposed to an extension spring. These compression-type scales are designed to sit on a desk or table. As with the extension spring in "hanging" scales, the compression spring is also installed in a direct line between the base of the scale and the item to be weighed that is usually placed in some type of attached pan at the spring's upper end. Another commonly used name for the compression scale is "candlestick" because of its obvious resemblance to a candleholder. Candlestick balances, dating from about the mid 1860s, display postal rates in 1-ounce increments. Canada Post continued to use its turn-of-the-century candlestick models in some of its rural and small town offices until the 1970s, according to Labiuk. For collectors, the age of a scale is obviously important but, like other collectible items, coming up with a reliable age can sometimes be a challenge. Being familiar with effective postal rates, or knowing where to look them up, can be helpful. A scale's approximate age can sometimes be narrowed down from the date it was taken out of service. For example, most spring-type scales have a paper sleeve or rate plate attached to the scale that are time specific. Postal Guides, issued by national postal administrations, contain listings of effective postal rates and the rates shown on the weight stickers attached to scales can be correlated to the rates in these guides. The first-class letter rate to the United States in the 1920s, for instance, was three cents per ounce whereas in Canada the rate was two cents per ounce. Therefore, a scale with a chart showing those rates would have had to have been manufactured before that time. One of the most recognized postal scales is the Precision model - a spring loaded device manufactured by the Triner Scale & Manufacturing Company of Chicago. It was also made and sold in Canada. Although the Precision scales used in Canada are indistinguishable from those in the Unites States, their attached weight stickers will make it immediately obvious whether the scale was used in Canada or in the U.S.
"Scales still in their original packing boxes are always harder to come by than those without them," explains Labiuk. "And extremely difficult to find," he emphasises. But in the 1920s these scales sold for as little as $2.75. Collectors divide postal scales into two main categories: corporate-owned models, that is those used exclusively in local post offices, and the commercial scales used by postal clients, usually at their place of business or in their homes or offices. Post office scales owned by a Post Office usually have an identifying mark of some sort showing that they are the property of an official postal administration. As government property, they have never been freely available to the public and for that reason are not easily obtainable by collectors. Commercial postal scales, on the other hand, are reasonably plentiful and relatively easy to acquire. Labiuk, who has been actively pursuing both types for about five or six years has close to 200 models represented in his collection. "No two are alike," he says. "My collection is at the stage where every new acquisition has to add a new element or some new feature." 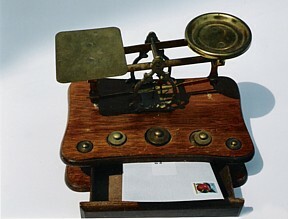 A postal scale with a noteworthy history that has been in widespread use in Canada over the years is the equal-arm balance. Although substantially more modern in appearance than its earliest predecessors, known to have existed in ancient Egypt 8,000 years ago, the equal-arm balance started out as a straight beam supported by a fulcrum at its horizontal centre. The base of the fulcrum was fastened to a pedestal to give it the needed support. Suspended were two pans attached by ropes threaded through an opening at each end of the straight beam: one to hold the loose weights, the other the item to be weighed. By about 2,000 years ago, the Romans came up with the idea of placing a pin through the centre of the beam to hold the central bearing in place. 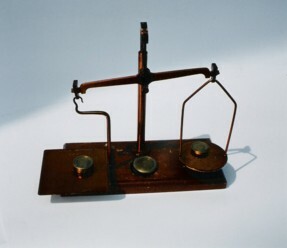 Improvements to the equal-arm balance continued to be made and with the invention of knife edges in the 18th century it was on its way to becoming one of the word's most accurate weighing devices. Unlike spring balance models, the equal-arm scale uses no pre-printed sleeve or chart to denote the required postage. Instead, a set of loose weights are used that correspond to the weight classes for the various postage rates. For example, the letter to be mailed is placed on one pan and incremental loose weights are added to the other until the two sides are balanced. With the widespread use of postal scales, it is easy to imagine that manufacturing and other companies would find them useful to advertise their products. 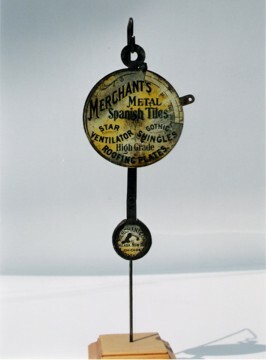 And, indeed, postal scale manufacturers in many parts of the world produced every imaginable type of scale that companies could hand out to their clients to promote and advertise their products. Novelty scales were equally popular. Some defy description. For instance, a base mounted compression model comes with a screw-down tapered top. When this cone-shaped top is in place the entire scale is not more than three inches high. But when the steel top is unscrewed it releases the compressed spring and, presto, you have a scale. The screw-on top when turned upside down and attached to the pop-up spring becomes the weighing pan. Other novelty scales are designed to resemble pens, letter openers, tire pressure gauges, envelopes, and similar everyday items. A Salter pen scale, looking for all intents and purposes like a fountain pen, weighs a letter by fitting it into a metal clip attached to one end of the pen-like device. Predating the novelty-type scales are the combination scales that date back to the late nineteenth century. In 1888, James Allen of Birmingham, England, designed a postage stamp box combined with a pocket letter scale. His creation resembled a locket. Made of polished brass and silver, the combined stamp box and scale is quite small - measuring only about 1.7 inches in height. Given its tiny size, it is surprising that it is capable of weighing items up to six ounces. Very popular also were the combination scales and coil stamp dispensers. One typical model features a simulated miniature street letter box alongside a pendulum-type scale mounted on a metal base. Some antique scales, as might be expected, have no manufacturer's name attached and can be identified only by the currency indicated on the rate sleeve of rate plate. For instance, a scale showing the monetary unit in Kroners would suggest a scale of Scandinavian origin. The Canadian Post Office Department relied for the most part on Great Britain to supply it with postal scales until the 1930s when U.S. manufacturers seem to have become serious competitors. Triner, Pitney Bowes, and Pelouze are names of postal scale manufacturers that collectors can still find at auctions, antique and collectibles shows, flea markets, and even garage sales. Although many scales are priced from as low as ten dollars, particularly for the office models with face plate names such as Precision, Reliance, Liberty, Gem, and Ideal, others, such as a Tiffany-style silver plate model, are priced much higher. Many of the high-priced models seldom come on the market. Caught up in an ever-changing world, it is not surprising that people are attempting to strike a balance in their lives by surrounding themselves with nostalgic items that remind them of a simpler time when not everything was accomplished at the push of a button. Antique postal balances fall into that category. Because antique postal scale collecting, an offshoot of the much broader field of scale collecting in general, is well defined, collectors have found in postal scales an enjoyable collecting sideline. The pursuit of postal scales is no longer limited to stamp collectors who, for some time now, have been reaching out beyond their traditional collecting areas into a wider field of postal-related artifacts. Postal scales are becoming ever more widely known as desirable items to own and enthusiasts in growing numbers are adding these attractive creations to their list of collectible interests.